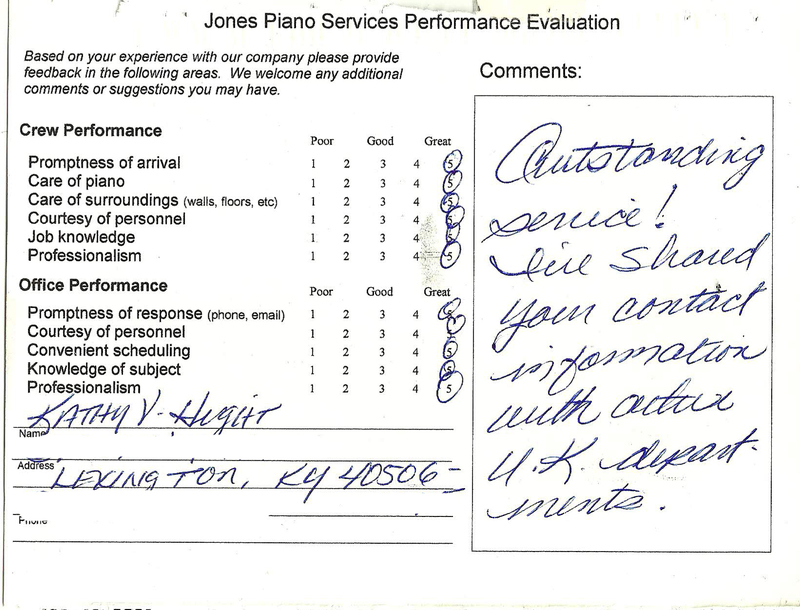 We encourage our customers to leave a review on Facebook, Angie’s List, or Google Places! “I had hired another company to do this job (Bright Side Moving) but they showed up late in a wrecked van, an old flat trailer hitched to the van with boards laid across the trailer. I couldn’t get a hold of my contact so I went home. While I was waiting for the secretary to call or my contact, another person contacted me stating she understood I was having a problem. She had been given this information by an employee who had heard what had happened. 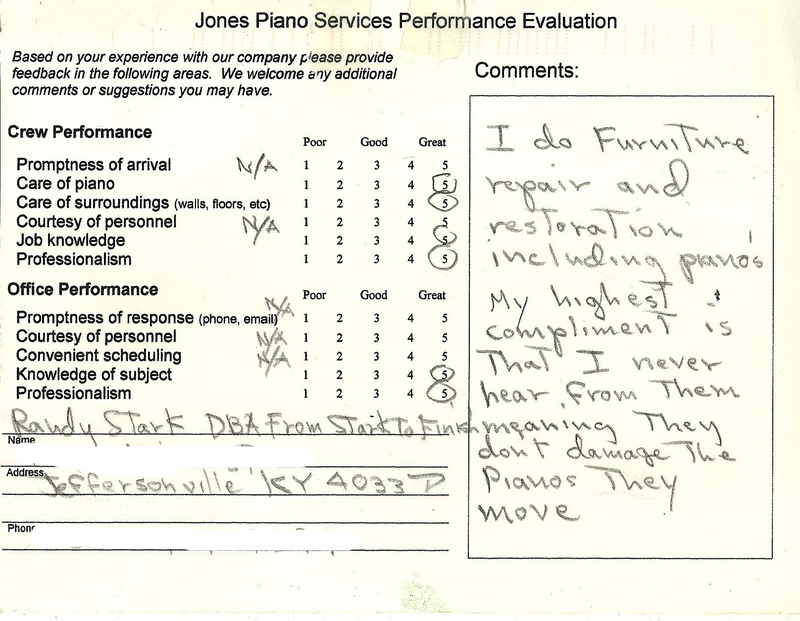 Jones Piano Moving said they could handle the job for me, but would have to call one employee in from out of town. She quoted me a price of less than what the other company had said it would cost. I met the two employees at the residence. They were waiting on me. They very carefully disassemble to clock the way you are supposed to and moved it to my residence. They moved the piano out and then moved the clock in and set it up. They knew what they were doing. Then they took the piano to my Cousin’s house as promised with no problems what so ever. They were very courteous even though they had been called on what was supposed to be their day off. I couldn’t ask for a better out come to what could have been a disaster. I’m very appreciative to Virginia Jones for contacting me. 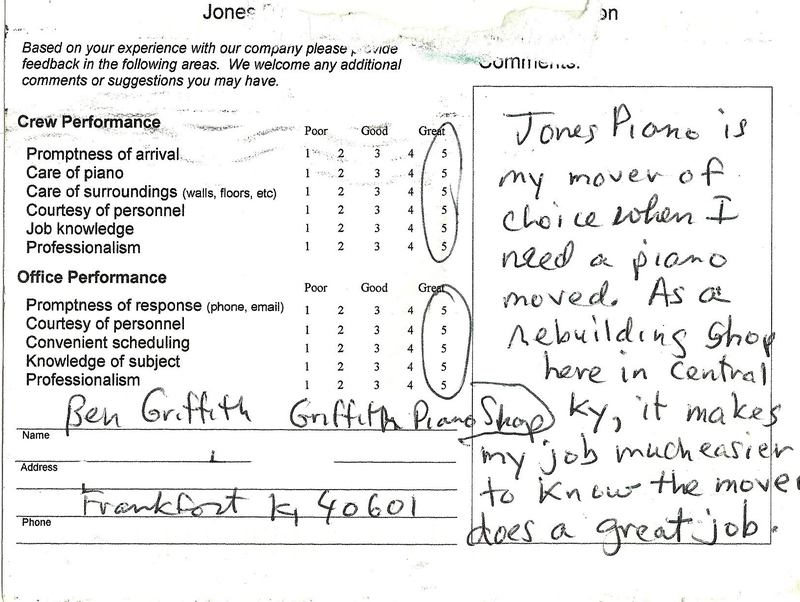 Ben Griffith, Owner Griffith Piano Shop, Frankfort, KY via Comment Card. “This (is) the company I should have hired for (the) entire job. Very responsible, responsive, professional. “Very professional. Called 30 minutes prior to arrival. It was obvious they knew what they were doing. The price was extremely reasonable. “Everything went perfect! Everybody in this company that I spoke with or worked with were courteous and helpful. They definitely know how to do their jobs and they do them very well! 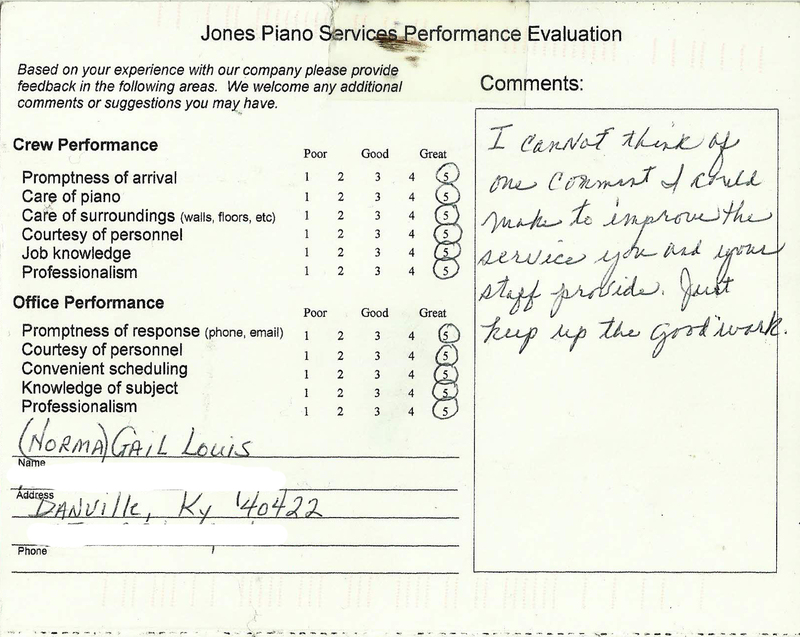 “The movers were right on time and were very professional and courteous. Our grand piano was bigger than they expected (my error), so they measured everything carefully before wrapping and moving it. We needed to clean the piano legs before transport and they helpfully disconnected them for us and waited for us to finish. They had all the equipment needed to get up and down our porch steps and got the piano out of our house and loaded on their truck in under half an hour. The piano was being delivered to my mother’s house across town and I wasn’t there when they dropped it off, but she told me that it arrived without any damage and that they set it up and moved it into place just where she wanted it, so she was very happy. 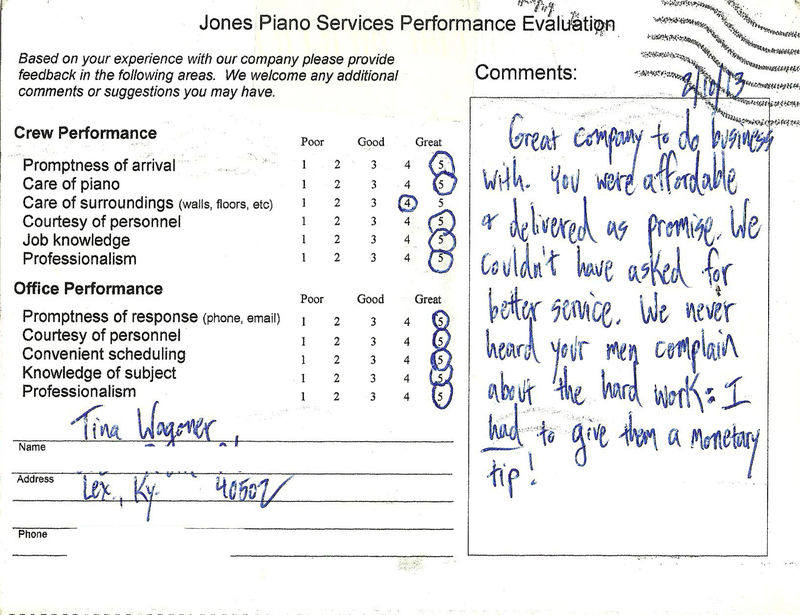 I don’t expect to need to move that piano again any time soon, but we were pleased with their service and would recommend them to others. 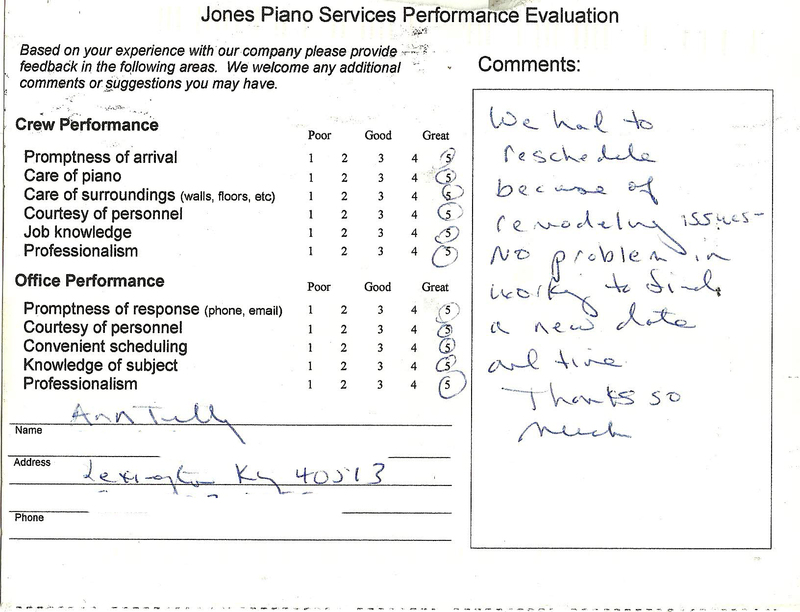 “They responded quickly with a price when I emailed about moving our piano. They showed up at the appointed time right on time with all the equipment they needed. The piano was moved to where we wanted in a flash with no damage to floors or walls along the way. It was all good – quick and painless.